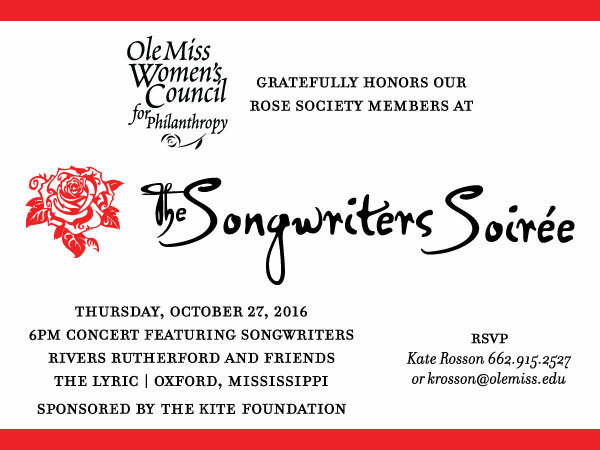 The Ole Miss Women’s Council for Philanthropy will be hosting their annual Songwriter’s Soiree for their Rose Society members on October 27th. Rose Society members are invited to attend this event featuring celebrity singer-songwriters Rivers Rutherford, Tom Douglas, and Brett James. Rutherford and Ole Miss alumni, has written songs that have gone on to win Grammy Awards, CMA nominations, over 20 ASCAP awards, and a Billboard Song of the Year award. He has written number one hits for Tim McGraw, Brad Paisley, Dolly Parton, Kenny Chesney, as well as Brooks & Dunn. Rutherford continues to write for celebrities and still maintains a demanding tour schedule. Brett James, another remarkable artist and songwriter for other well-known country and pop music artists will finish the trio of musicians playing that evening. Among James’ compositions is Carrie Underwood’s 2006 number one hit “Jesus, Take the Wheel,” which received Grammy Awards for Best Female Country Vocal Performance and Best Country Song. His writers’ credits also include number one hits for Jessica Andrews, Martina McBride, Kenny Chesney, Rodney Atkins, and Jason Aldean. The evening will feature performances from Rutherford, Douglas, and James of their original, award-winning songs that they have written for celebrity singers and performers. The Songwriter’s Soiree is an exclusive event for Rose Society members as an annual event to thank members for their gifts of support for the Ole Miss Women’s Council.